محبیان, رضا, یاری, مصطفی, ریاحی, محمد‌علی. (1391). مقایسه روش‌‌های تجزیه‌طیفی برای شناسایی کانال‌‌ها در یکی از مخازن جنوب غربی ایرانمقایسه روش‌‌های تجزیه‌طیفی برای شناسایی کانال‌‌ها در یکی از مخازن جنوب غربی ایران. مجله ژئوفیزیک ایران, 6(1), 84-94. رضا محبیان; مصطفی یاری; محمد‌علی ریاحی. "مقایسه روش‌‌های تجزیه‌طیفی برای شناسایی کانال‌‌ها در یکی از مخازن جنوب غربی ایرانمقایسه روش‌‌های تجزیه‌طیفی برای شناسایی کانال‌‌ها در یکی از مخازن جنوب غربی ایران". 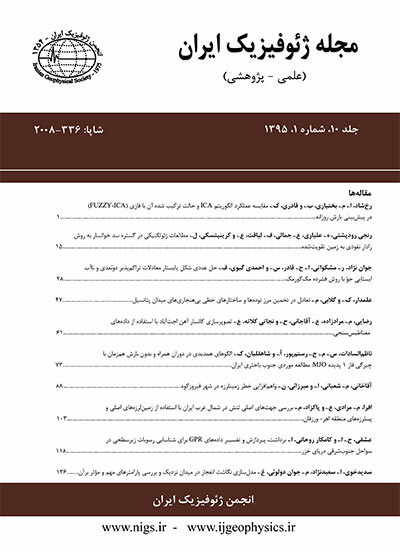 مجله ژئوفیزیک ایران, 6, 1, 1391, 84-94. محبیان, رضا, یاری, مصطفی, ریاحی, محمد‌علی. (1391). 'مقایسه روش‌‌های تجزیه‌طیفی برای شناسایی کانال‌‌ها در یکی از مخازن جنوب غربی ایرانمقایسه روش‌‌های تجزیه‌طیفی برای شناسایی کانال‌‌ها در یکی از مخازن جنوب غربی ایران', مجله ژئوفیزیک ایران, 6(1), pp. 84-94. محبیان, رضا, یاری, مصطفی, ریاحی, محمد‌علی. مقایسه روش‌‌های تجزیه‌طیفی برای شناسایی کانال‌‌ها در یکی از مخازن جنوب غربی ایرانمقایسه روش‌‌های تجزیه‌طیفی برای شناسایی کانال‌‌ها در یکی از مخازن جنوب غربی ایران. مجله ژئوفیزیک ایران, 1391; 6(1): 84-94. از اولین روش‌های زمان- بسامد در تجزیه طیفی تبدیل فوریه زمان-کوتاه (STFT) است. در این روش پنجره‌ای مناسب با طول ثابت در نظر گرفته می‌شود. امواج لرزه‌ای از جمله امواج غیرپایا هستند که محتوای بسامدی متغیر با زمان دارند. ازاین‌رو باید از روش‌هایی بهره گرفت که طول پنجره در آنها متغیر با بسامد باشد. از جمله روش‌هایی که می‌تواند مورد استفاده قرار گیرد تبدیل s است. در این روش تفکیک‌‌پذیری زمانی و بسامدی در صفحه زمان- بسامد تغییر می‌کند تا یک تحلیل با تفکیک‌پذیری چندگانه به‌دست آید. علاوه‌‌براین روش دیگری تحت عنوان تجزیه با تعقیب تطابق (MPD)، که روش جدیدتری نسبت به روش‌های پیش‌گفته‌ است، وجود دارد که در الگوریتم خود از توزیع ویگنر- ویل استفاده می‌کند. در این مقاله از مقاطع لرزه‌ای تک‌‌بسامد که با استفاده از روش‌های زمان-بسامد مقاطع لرزه‌ای حاصل شده است، برای تشخیص کانال‌ها استفاده می‌شود..
Spectral decomposition has provided a means for observing those features in seismic data that are not always clear in the time domain. There are several approaches that can be used to produce a spectral decomposition of a seismic trace. A case history of using the spectral decomposition and coherency to interpret incised valleys was shown by Peyton et al. (1998). Partyka et al. (1999) used a windowed spectral analysis to produce discrete-frequency energy cubes for applications in reservoir characterization. Continuous wavelet transform (CWT) was introduced by Morlet et al. (1982). In CWT, time frequency atoms are chosen in such a way that its time support changes for different frequencies according to Heisenberg’s uncertainty principle (Mallat, 1999; Daubechies, 1992). In early years, transforming the seismic traces into time and frequency domain was done via a windowed Fourier transform, called the Short Time Fourier Transform (STFT). In STFT, the time-frequency resolution is fixed over the entire time-frequency space by reselecting a window length. Therefore, the resolution in the seismic data analysis becomes dependent on a user-specified window length. This problem can be resolved by an S-transform .The window used in this method at any given moment is adapted to the frequency analysis. In this method, time and frequency resolution will change the window of the time–frequency to obtain a multi-resolution analysis. The CWT commonly used in the data compression decomposes the signal from the time domain to a time-scale domain using the orthogonal wavelets that vary in length and frequency by a factor of two. In contrast, the S-transform decomposes the signal from the time domain to a time-frequency domain using the non-orthogonal variable size Morlet wavelet (Mallat, 1999; Stockwell, 1996; Sinha, et al., 2005). While being computationally more intensive than the orthogonal wavelet transform, the nonorthogonal S-transform provides an added time and frequency resolution valuable for interpretation. St­ockwell et al. (1996) interpreted the S-transform as a combination of CWT and STFT. The difference between the S-transform and STFT is that the Gaussian window is a function of time and frequency for the S-transform, while it is only a function of time for the Short Time Fourier Transform (STFT). Another method of spectral decomposition is Matching Pursuit Decomposition (MPD). MPD involves a cross-correlation of the wavelet dictionary against the seismic trace. The projection of the best correlating wavelet on the seismic trace is then subtracted from that trace. The wavelet dictionary is then cross-correlated against the residual, and again the best correlated wavelet projection is subtracted. The process is repeated iteratively until the energy left in the residual falls below some acceptable threshold (Castagna, 2006). MPD has been used recently in a seismic signal analysis (Castagna et al., 2003; Liu and Marfurt, 2005). Wang et al. (2007) has applied an inverse-Q filter to the seismic signals to show the existence of a low-frequency shadow. One of the applications of the spectral decomposition is to detect the geological structures with less thickness such as buried channels. Filled with porous rocks, and located in a non-porous environment, the channels will be a good place for hydrocarbon reserves. For this reason, from the past, detection of the boundary of these channels and lithologic features inside them has been essential in explorations of these reserves. In this paper, we investigated the application and efficiency of the S-transform and MPD methods in the time-frequency analysis of the seismic sections to delineate and detect a buried channel in Sarvak Formation in one of the oil fields located in the South West of Iran. The results from the MPD and S-transform were compared with an STFT applying to the single frequency seismic sections at frequencies 15 Hz and 25 Hz. ذبیحی نائینی، ا.، 1384، تحلیل مقاطع لرزه­ای در حوزه زمان- بسامد برای تصویر‌‌سازی لایه­های نازک و مخازن هیدروکربور: پایان‌‌نامه کارشناسی ارشد، مؤسسه ژئوفیزیک دانشگاه تهران. روشندل کاهو، ا.، 1388، بهبود تبدیل­های زمان-بسامد در مطالعه داده­های لرزه­ای: پایان‌‌نامه دکتری، مؤسسه ژئوفیزیک دانشگاه تهران. Addison, P. S., 2002, The Illustrated wavelet transform handbook: Institute of physics publishing, Bristol and Philadelphia, 351. Castagna, J. P., Sun, S. and Siegfried, R., 2003, Instantaneous spectral analysis: Detection of low-frequency shadows associated with hydrocarbons: The Leading Edge, 22, 120-127. Castagna, J. P., and Sun, S., 2006, Comparison of spectral decomposition methods: First Breaks, 24, March 2006, 43-47. Chakraborty, A. and Okaya, D., 1995, Frequency-time decomposition of seismic data using wavelet-based methods: Geophysics, 60, 1906-1916. Liu, J., 2006, Spectral decomposition and its application in mapping stratigraphy and hydrocarbons: thesis, Ph.D., Department of Geosciences, University of Houston. Liu, J., and Marfurt, K. J., 2007, Instantaneous spectral attributes to detect channels: Geophysics, 72, 23-31. Mallat, S. and Zhang, Z., 1993, Matching pursuits with time-frequency dictionaries: IEEE Transactions on Signal Processing, 41, 3397-3415. Mallat, S., 1999, A wavelet tour of signal processing: Academic Press, 2nd edition, San Diego, California. Mertins, A., 1998, Signal analysis: wavelets, filterbanks, time-frequency transforms and applications: John Wiley & Sons, West Sussex, England. Matos, M. C., Osorio, P., Mundim, E. C., and Moraces, M., 2005, Characterization of thin beds through joint time-frequency analysis applied to a turbidite reservoir in Campos Basin, Brazil: 75th Annual International Meeting of SEG, Houston, Expanded Abstracts, 1429-1432. Morlet, J., Arens, G., Fourgeau, E. and D. Giard, 1982, Wave propagation and sampling theory: Part I, Complex signal and scattering in multilayered media: Geophysics, 47, 203–221. Partyka, G. A., Gridley, J. and Lopez, J., 1999, Interpretational applications of spectral decomposition in reservoir characterization: The Leading Edge, 18, 353-360. Peyton, L., Bottjer, R. and Partyka, G., 1998, Interpretation of incised valleys using new 3-D seismic techniques: A case history using spectral decomposition and coherency: The Leading Edge, 17, 1294–1298. Rioul, O., and Flandrin, P., 1992, Time-scale energy distributions: A general class extending wavelet transforms: IEEE transactions on signal processing, 40, 1746-1757. Sinha, S., Routh, R., Anno, P., and Castagna, J., 2005, Spectral decomposition of seismic data with continuous-wavelet transform: Geophysics, 70, 19-25. Stockwell, R. G., Mansinha, L., and Lowe, R. P., 1996, Localization of the complex spectrum: The S-Transform: IEEE Transactions on Signal Processing, 44, 998-1001. Wang, Y., 2007, Seismic time-frequency spectral decomposition by matching pursuit: Geophysics, 72, V13-V20.